Guest contributor Clayton Nicholls talks Barra baits in all its forms. A lot of people fish for Barra and there are many ways for this to be done. There really are no incorrect ways however there are many productive methods. These methods range from bait to soft plastic and hard body lures. Keep in mind though that when fishing for these popular and almost cultural sports fish, bigger isn’t always better. The first thing you will need to know is the basics of this fish: where they live and how they behave. These fish grow up to 1.8 metres but are more commonly found between 60-70cm, which is still quite a large fish. Barra can most likely be found hiding and waiting for prey in structures such as trees, rocky outcrops, mangroves, drop offs and even manmade structures such as bridge pylons. Barra will engulf the lures/bait by inhaling vast quantities of water into their bucket mouth; as soon as they are hooked you can expect a big fight of aerobatic jumps or deep runs or a mixture of anything in between. 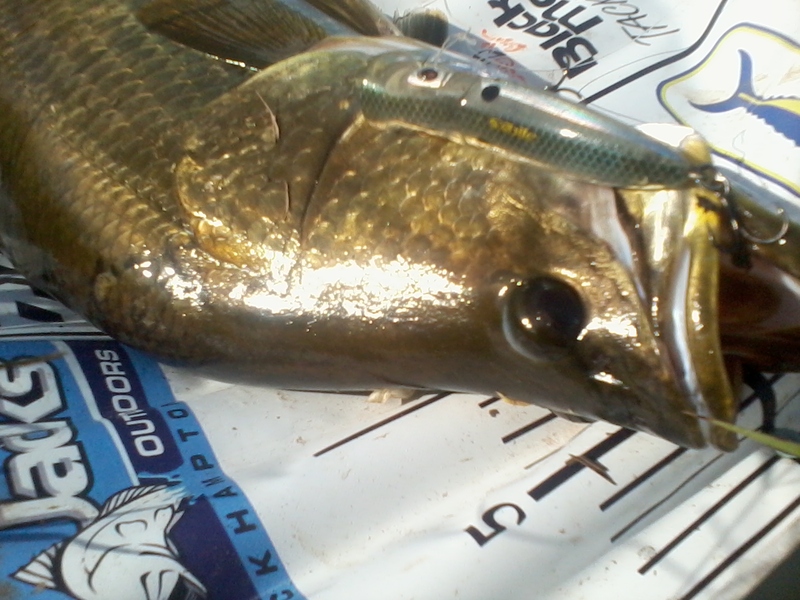 Bait: barramundi are not fussy when it comes to bait but as the rule stands, ‘fresh is best’. 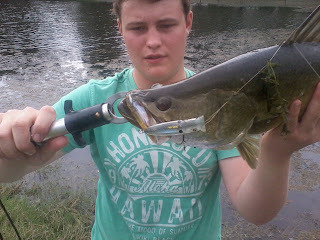 This can be in the forms of fish like perch or poddy mullet; both are top barra baits. If you are not able to access fresh bait, all good tackle stores will have frozen poddy mullet or even mullet strips. For best results, the live baits are better off hooked through the shoulders or tail with a 3/0 to 6/0 circle hook connected to 20Ib or higher mono leader. The frozen poddy mullet or mullet strips can be hooked using a 3/0 suicide out of the side and a half hitch around the tail, this method is extremely effective for lobbing into timber or a snaggy region. The gear of choice for bait would be a sturdy rod, capable of casting baits and bringing home the big ones; usually a 3-6kg 6 foot rod will be ample. Reels can be whatever suits your style of fishing, bait runners on with their secondary drag engaged are great for fishing with bait yet bait casters with a loud ratchet in free spool do the same job. Your normal spin reel with a loose drag can also be just as effective: when the fish takes the line using this method, open the bail arm, tighten the drag, close the bail and watch the rod load up. Soft Plastics: Soft plastic lures have been the most common and widely used lures in this modern era of fishing, whether it’s the price, the extremely customisable actions or the vast variety of styles and colours, all fisherman these days have a few trusty plastics in their tackle box. Plastics often range from shrimp imitations, gar copies, mullet, curl tail grubs, baitfish, and a variety of bugs, worms, and shapes you cannot match to any living creature; basically anything you can make a mould for. Barra will take what looks like their main food source. If there is a river teaming with mullet use a mullet style plastic such as Gulp Pogy, Sebile Stickshad hollow and the well-known squidgy slick rig. When estuaries are chockers with prawns it would be a good time to throw out prawn profile lures such as Gulp 3” Shrimp, Eco gear bream prawn and D.O.A shrimp, keep in mind in the estuaries most Barra are not normally over 60cm but any Barra will engulf these shrimp look-a-likes. If there is a spot where the Barra will hit anything, a lure with a hot swimming action will surely help turn on the bite just that bit more, lures like the Atomic Guzzler and Sebile Magic swimmer hollow will work well. Fishing in dams and waterholes around timber, weed beds or lily pads, lures like Squidgys’ Pro slick rig and pro boof frog work great, Z Mans’ pop frog also account for large numbers of fish, each of these lures are rigged weedless. All soft plastic lures require different movements to suit the actual plastic, even a different weighted jig head can make the action different, lift and drop, slow roll and twitching are a good basis. Once your fishing, look at how the lure moves best, customise the retrieval to suit the day, lure and outfit. The outfits many people use for soft plastics on Barra are a 7ft 2-5kg spin rod and a 2000 size spin reel; this is good for the majority of Barra. Areas with larger fish such as Lake Awoonga would need a 7ft 4-7kg spin rod and a 3000-4000 size reel. For the mainline, braid from 6-20Ib will suit, catering for the area your fishing and the size of fish you are catching. The leader is generally the same as the main and up to twice as heavy. Hardbody: hard body lure come in a range of shapes and sizes from poppers and stick baits to deep divers. The typical idea is to throw out lures in ‘the rave’ such as gold bombers but do not get me wrong they are great lures. This idea is okay if the lure matches your area, deep divers suit well in a river or lake trolling for Barra, shallow divers casting at snags and surface lures for fishing the top. But that’s not it, not only do hard bodies have bib sizes or no bib at all they can come in all different styles from floating and suspending to sinking and fast sinking. If you are casting at snags along riverbeds or estuarine inlets, a shallow diver 60-100mm long and floating will do the job almost every time. A few twitches to get the lure down and letting it rise back to the top will entice even the fussiest of Barra. Lures like Bombers, Barra classics, Koolie minnows, X-raps, A-cast minnows and river rats would be some go-to lures for this application. Rubble patches and deep pockets in rivers or trolling in rivers and lakes would require you to find the depth: if the lure is just touching the bottom and kicking up a little dirt it’s going to get munched on by a Barra for sure. Always try to estimate how deep the water is and look on the box of the lure to see how deep it dives. Classic Barra come in sizes like 3ft, 10ft, 15ft, 30ft, whereas lures like a Sebile Koolie minnow bib size is marked SL (small lip) all the way through to LL(large lip) and BRL (big round lip). With this being said, the Sebiles will have the actual diving depth for that lure printed on the box. For trolling and casting into deep pockets and rubble patches lures used for casting at snags would be fine, just in their deeper diving forms. Barra on the surface is one of the most amazing spectacles, whether the lure you use imitates bugs, prawns or fish swimming along the surface if a Barra hits it and clears the water you are in for a real treat. Slow retrieve with heaps of splashing to imitate insects, large pops then a long pause to entice the Barra out of the Lilly pads and the constant pop on a medium retrieve to cover the vast distances of water are effective retrieves. A little walk the dog retrieve in an opening of water in a weed bed gets them all the time too. Lures that will do this and more are R2S bubble pops, Rapala skitter pops, Sebile splashers, and 3B pop dogs. The outfits many people use for hard bodies on Barra are a 6-7ft 2-5kg spin/bait cast rod and a 2000 size spin reel or low profile bait caster, this is good for the majority of Barra. Areas with larger fish such as Lake Awoonga would need a 7ft 4-7kg spin/bait cast rod and a 3000-4000 size reel or heavy low profile bait caster. For the mainline, braid from 10-30Ib will suit, catering for the area you are fishing and the size of fish you are catching. The leader is generally the same as the main and up to twice as heavy. This article is purely a guide, your Barra experience will be up to you personally, match the area, do not use too heavy gear, but if you are not confident with light gear do not go too light. See what other people in that area use and even try it out. Grab some gear, get in and give It a fair crack, I may even see you out there. Fish light and get the bite. Words and pics: Clayton Nicholls. You can read more from Clayton at his blog.